Clear’s Bagua. Learn to fight with Baguazhang. Sigung Clear has studied Bagua since 1981. As soon as a threat presents itself Bagua delivers devastating hand strikes while taking evasionary action. The specialty of Bagua is in defeating multiple opponents and so evasion, timing & positioning skills are all highly refined. Even aggressive arts like Xing Yi and other Kun Tao styles will find the Bagua practitioner difficult to hit. Bagua is quite diverse and there are many different styles, moves and patterns to be found in the art including many different internal training methods and energy palms such as iron palm, vibrating palm, poison hand, penetrating palm, crushing palm and more. Bagua is very popular and well respected in Java where the art was refined and honed due to the bladed nature of Indonesian culture. When seriously attacked by a group of knife wielding assailants you either move well or you die. Kun Tao is old hand Kung Fu from the temples & family systems of China that began migrating to the spice islands in the 1200′s. In order to survive alongside the vicious arts of Pentjak Silat, Kun Tao masters had to refine their art to its core & focus only on the most effective & powerful fighting methods. As a result Kun Tao was rarely taught to non-family members & almost never taught to non-Chinese. Kun Tao styles are lethal with a unique & unmistakable expressive explosiveness. Methods tend to use devastating internal power combined with the advanced timing and movement necessary for survival against aggressive groups of attackers. Sigung Clear has studied Ba Gua since 1981. His studies include learning several different family systems of Bagua including studying in mainland China from lineage inheritors of the system in Beijing, Tianjin and Shanghai. Sigung Clear’s Kun Tao Silat teacher is Willem de Thouars who studied directly from Buck Chen. Willem de Thouars Bagua is very combat efficient and it is as beautiful as it is deadly. Bagua designed from the ground up for at least 6 – 8 attackers. You will need at least 4 training partners to practice the drills and gain the skills taught in this program. This program will teach you how to use Bagua and how to develop the Internal Power & Skill a good Bagua fighter should have. We will NOT spend a lot of time on forms or on the technical basics you can easily learn from any other Bagua program out there. This program is an in depth study of how to fight and defend yourself with Baguazhang. The focus is on fighting methods and applications against multiple attackers. Learn to effectively train the essential skills and principles of Bagua. Chapter 1: Multiple Attacker Training – The fighting strategy, principles and application of Circle Walking. This will give you the tools and training progression to successfully evade and counter attack a group of attackers. 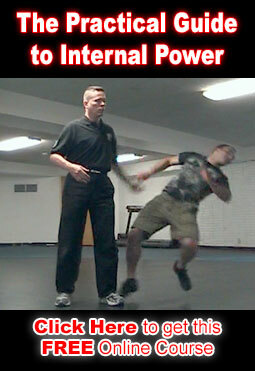 Internal training for continuous power. How to turn your back on an opponent without leaving yourself open. Throws and counter attacks against multiple opponents. Application of Palm, forearms, elbows, shoulders, head, knees & feet. Learn superior position and timing skills to defeat multiple opponents. Chapter 2: Swimming Dragon – Is a very powerful and effective Bagua Body Skill. This DVD contains a series of drills and exercise that will build this quality and teach you to use it effectively against a group of attackers. Chapter 3: Essential Palms – Learn to fight with the essential Palms of Baguazhang. Learn how these palms relate to each other and how to mix and match them for maximum effectiveness. Chapter 4: Body Methods & Energies – Learn the basic body methods & internal principles of Baguazhang for maximum internal power and combat effectiveness. We begin with drills to help you employ the basic Bagua energies & body methods against multiple opponents: Floating Root, Whole Body Ball, Swimming Dragon, Hawk Soaring, White Cloud, Bear Body, Spiral & Predator. Here we work with spinning & footwork in Bagua. This chapter contains an in depth analysis of 90, 180, 270, 360, 540, 720 degree spins and how to use them against multiple opponents. Including how to use your spins, arcs & circles to control a group. Now that you’re skilled at spinning we show you how to combine this with Bagua stepping methods for greater effectiveness. Learn what different circle sizes are for & how they affect your fighting ranges. You’ll also learn to destroy grabs, grapples, takedowns and tackles. Train your inner ear for stability while you’re rapidly spinning and turning. Learn Yi training to disorient the opponent and disrupt their balance. How to escape from the center of a determined group of attackers. Make your legs as deadly and devastating as your hands with the kicks stomps and aggressive footwork of Bagua. In this chapter we introduce Bagua’s Double Palm and Double Palm Change and how it relates to everything you’ve been working on. Use this bagua principle to increase your speed and your ability to control the space around you. Learn to get out of tight spaces and corners. Learn the basics Bagua Knife and stick work and learn to combine all the skills taught in this course and how to train them properly. Click Here to start training now! Learn to fight with Baguazhang. Sigung Clear takes the art Baguazhang and breaks it down so you can learn to fight quickly and effectively. Check back for details on our 2017 workshop!